WordPress not only gives users the ability to create powerful websites with great features, it also allows users to make customizations to add extra security, streamline deployment and assist with administration. wp-config is the primary WordPress configuration file. It contains your database name, database user and password, unique authentication keys, table prefix and other important information. To add an extra layer of security, you can move wp-config.php outside of the WordPress installation directory. This means for a site installed in the root of your web hosting space (e.g the public_html directory), you can save wp-config.php outside of the web root folder. You can also create a new directory outside of public_html or you can save wp-config.php in an existing directory, and WordPress just works. WP-CLI stands for WordPress Command Line Interface. WP-CLI is a set of command-line tools for managing WordPress installations and it’s extremely powerful. You can perform common tasks very easily such as updating WordPress, generating backups, updating plugins and setting up WordPress Multi-site just to name a few. The WP-CLI project website has all the details on how to install and use WordPress’ command line interface. If you use DreamHost, WP-CLI is installed on all their servers. For more information, you can visit the DreamHost Wiki. Normally, most of us log into our WordPress sites without SSL enabled, but WordPress allows you to force SSL logins and access to the Administration Dashboard. You also need an SSL certificate setup for your domain. SSL certificates will cost you around $10 to $50+ annually. The WordPress Administration Over SSL Codex page has all of the details for those wanting to know more. While this isn’t a native feature of WordPress and requires a plugin, we felt that it’s related to some of the other tips covered in this article and deserves a mention. Two-factor (or two-step) authentication is the process of requiring 2 pieces of information to log in, not just a password. Usually it’s a hardware token such as a Yubikey or a service such as Google Authenticator or Duo. Some of the various security plugins also offer two-factor authentication. Did you know that WordPress allows you to customize your installation directory as well? Normally, you would install WordPress in the root directory (e.g public_html) but WordPress also allows you to install it in a subdirectory http://domain.com/wphere and your site address (URL) will remain same http://domain.com/. 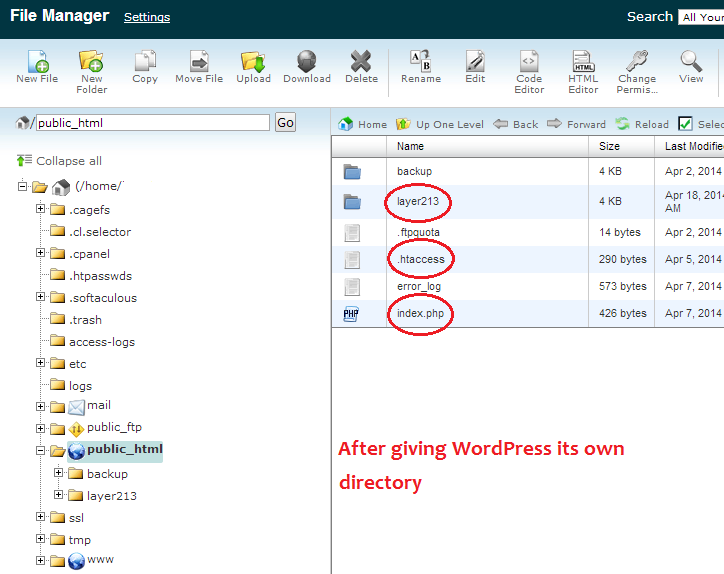 Here is a screen shot of WordPress installation in root directory. You can name the directory where the WordPress files will be located to anything you like. In my case, you can see I have named it layer213. One reason for wanting to do this is to move the files and directories that clutter up your web root to somewhere else. Your website will still appear to be installed in the web root and your URLs will still work as normal. It may seem strange, but it’s a fully supported configuration, covered in more detail at the WordPress Codex. Please note: You should only attempt to do this if you have FTP/SFTP access to your server and you are comfortable getting hands-on with copying and moving files. Let’s walk through the steps needed to install WordPress in its own directory, or if you have already installed it in a subdirectory, how can you change these settings. 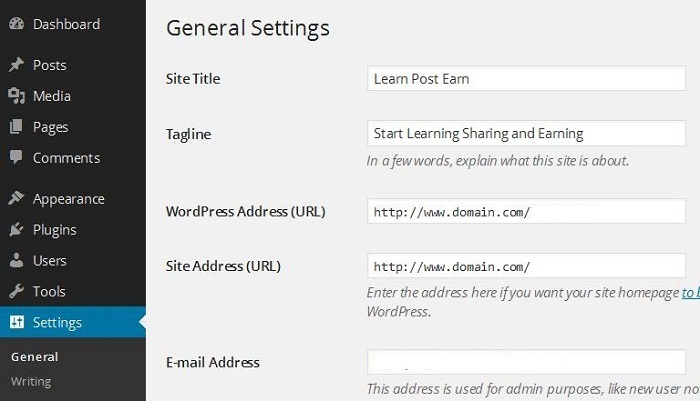 Log in to your WordPress dashboard go to Settings and General. 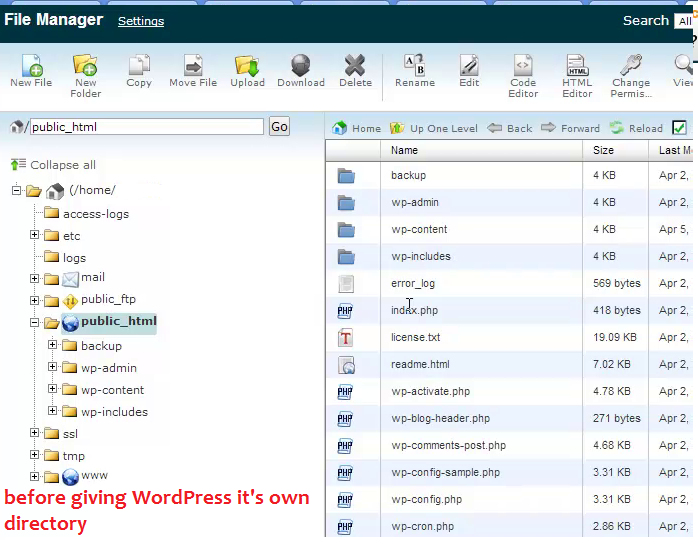 Below is a screenshot of WordPress Dashboard before moving the WordPress files. Now change WordPress Address (URL) with your directory name, whatever you want to name your directory. In my example, I have given it layer213. Site Address (URL) will remain same. Here is a screenshot after changing WordPress Address (URL). Now click Save Changes. 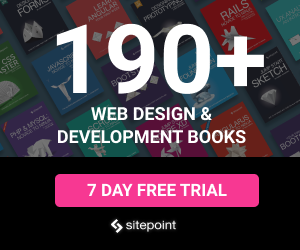 Don’t worry if you see any errors or your site without any styles. This is normal, we are yet to move the files the new location. Now log in your web hosting Control Panel (cPanel or Plesk etc) or connect via FTP/SFTP. Go to your File Manager and create a new directory. Name it layer213 (change this to whatever name you’d like), the name must be the same as what you entered in the WordPress Dashboard. Select all the WordPress files except the new directory that you created. In my case it is layer213 and move all files to this new directory. Copy (Do NOT MOVE!) the index.php and .htaccess files from the new WordPress directory into the root directory of your site (e.g public_html). Save the changes and upload it to the root directory (e.g pubic_html) of your web server. When you open cPanel and click on File Manager, check the box which says ‘Show hidden files’. Hidden files like .htaccess will then become visible in your File Manager. If you’re running WordPress on a Windows IIS Server and have enabled Permalinks, you will be using web.config rather than.htaccess. 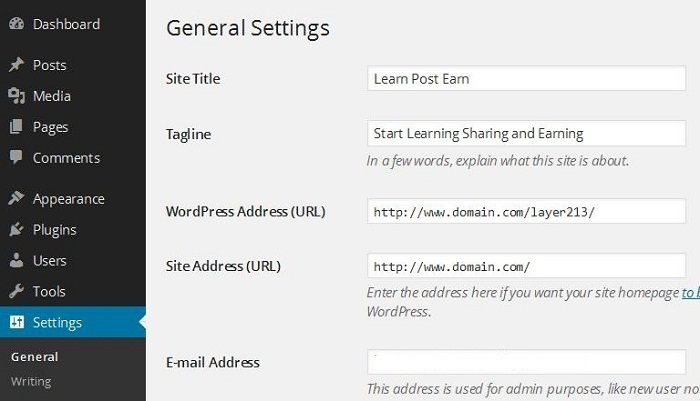 Now log into your WordPress Dashboard by typing http://www.domain.com/layer213/wp-admin/ and update your permalink structure if you have it set up. If for any reason WordPress fails to update the permalink structure, it will display the new rewrite rules. Copy and paste these new rules manually into .htaccess file which resides in the root directory. If you have already installed WordPress in a subdirectory, you will have to copy index.php and .htaccess files to your root directory. Before moving these files, log into your WordPress Dashboard and go to Settings and then the General tab. Change the Site Address (URL) to your root directory. For example, if the URL is http://domain.com/layer213 then change it to http://domain.com and Save Changes. Don’t worry if you see any errors, this is expected. After changing the Site Address (URL) now copy (don’t move) index.php and .htaccess from layer213 (in my example above) to the root directory of your site (e.g public_html). Change layer213 to your directory name. Save the changes and then upload the file to the root directory. Your log in address will remain same as before. You can see a screenshot below after giving WordPress it’s own directory. Please remember your site will not function correctly when carrying out some of the above steps. If you have lots of visitors you might want to enable Maintenance Mode. You can install a free Maintenance Mode plugin to enable Maintenance Mode with a few clicks.